New Year’s Goals. Or Not. When I wrote up my blog schedule, I thought today I’d blog about my non-writing-related goals for the New Year. Except I don’t have any. The thing about setting annual goals is that I change them frequently throughout the year. Either my schedule changes–the drawing class I’m signed up for this spring means I won’t be doing something else that day, but once it’s over I get that time back–or my interests change–more/less tennis, less sewing, more drawing, less/more piano, whatever. I don’t really want to force September Elizabeth to run three times a week if she’s decided she wants to swim, or to draw every day if she decided she doesn’t like it. I trust my future self to make her own decisions. I do have a bunch of writing goals, which I’ll cover tomorrow, but even those are on a list that I plan to revise throughout the year. So, while right now, I would like to learn to draw, play more tennis, and learn to play Air on the G String on the piano, by June I might have come up with some other plan. 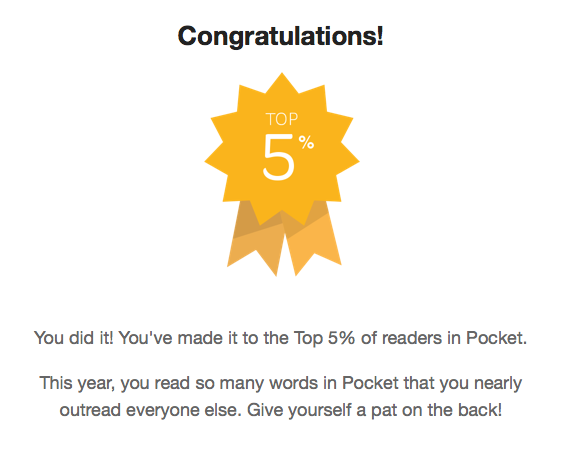 Apparently I read 730,498 words in Pocket this year, which they say is like reading The Great Gatsby 16 times. Though I wonder, do they actually keep track of which articles I save to Pocket and then archive or delete? Or do they assume I read everything I save? If the latter, they’re seriously overcounting. If the former…I need to read more books. Or catch up on my magazines. 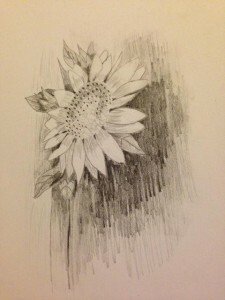 I signed up for a drawing class from the Champaign Park District yesterday. It doesn’t start until February, but I’m already excited. The supply list included charcoal and markers as well as pencils, so I’ll get to try some new techniques (and I know what I’m getting for Christmas, too). I’m looking forward to having feedback from an instructor. I can find problems in what I’m drawing all by myself, but figuring out how to fix them is harder. I was doing a great job posting regularly before my January hacking incident. When I cut back on blogging, one of the things that I dropped was my monthly lists of things I’d posted on the blog of All Rights Reserved, my mostly local writing group. So, here is an approximately quarterly roundup. This is not everything, just the things I still think are worth pointing out. My story “The Girl with Flowers for Hair” will be emailed to Daily Science Fiction subscribers tomorrow. Everyone else can read it on the web next Tuesday. The story mentions drawing and improving at it. I’ve wanted to draw for a long time, but I didn’t get around to trying until recently. You know the joke about drawing instructions? Step 1, Draw an oval. Step 2, Add a few lines. Step 3, Paint the Mona Lisa. That’s what it always seemed like. Last year I bought a couple drawing books and this year I started looking at them (mostly Drawing for the Absolute and Utter Beginner). It explains things in a way my art-deficient brain can understand. Friday I drew this sunflower, from Drawing Nature for the Absolute Beginner. It’s the first thing I drew with actual drawing pencils instead of a single mechanical pencil. Having a choice of pencils made shading it a million times easier. I still have a lot to learn, but it’s starting to feel like I could eventually do this well enough to entertain myself. Whenever I think that I wish I’d known earlier that I wanted to write novels, because then I could have taken different classes in college, and not started grad school for physics, and and and — I remind myself that I like my life, and I made good decisions for what I wanted to do at the time, and while my life would have turned out differently it probably wouldn’t have turned out any *better*. This weekend I was lucky to be able to attend a writing retreat. I love hanging out with other writers, and I’m more productive when I don’t have my house/yard/etc. around to distract me. I finished revising another chunk of my novel, revised a short story, and mostly went over all the ideas I’ve developed for the book I’m writing next and created an outline. The writing process I’ve developed means that even though I haven’t started writing the book yet, I have 27,000 words on it. Not all of them will make it into even the first draft, much less later drafts. But it’s nice not to start from zero. This month I’ll be finishing the rest of the novel revisions, developing a more detailed outline of the new book, and starting to put words into the actual draft. Speaking of productivity, I’ve increased the amount of writing time I put in each week by around 50% since spring. I have the same amount of time blocked out on my schedule, but having more of it on weekends than weekday evenings means I am more likely to put the time in. This also explains the state of my yard and the half-finished pair of shorts on the sewing table. For the past few weeks, I’ve been revising a novel to submit to Strange Chemistry while they’re taking unagented submissions. I like having a deadline to aim for. I usually dislike revising, but this has been going well–of course, it’s also the third time I’ve gone over this book, so most of the big problems were already taken care of. It’s still taking a big chunk of my writing time, but not all of it: I’m also working on the outline of the book I want to write this winter. Combining those two projects is taking a lot of time. Last week I didn’t quite get everything done that I wanted to, even though I hit all of my scheduled writing slots. So this week I’ll be trying to squeeze in more writing time. Which is a very long way of saying that I haven’t gone through more photos of my July trip yet. In other news, I sold another story to Daily Science Fiction, so look for that in a few months. I like working on books but the short production time for short stories, especially flash, is really nice.